Collecting, conservation, research and education – up until now, these were the classical tasks of a museum. Today, new challenges await these cultural institutions. Museums are having to adjust to demographic changes and altered viewing habits in the digital age. In this context, a museum’s visibility within the flood of information is decisive, as is the question of whether it leaves a lasting impression in the web. The need is growing for contact with one’s favourite museum in the web as well. But successful communication in social networks can be achieved only with a smart digital strategy. 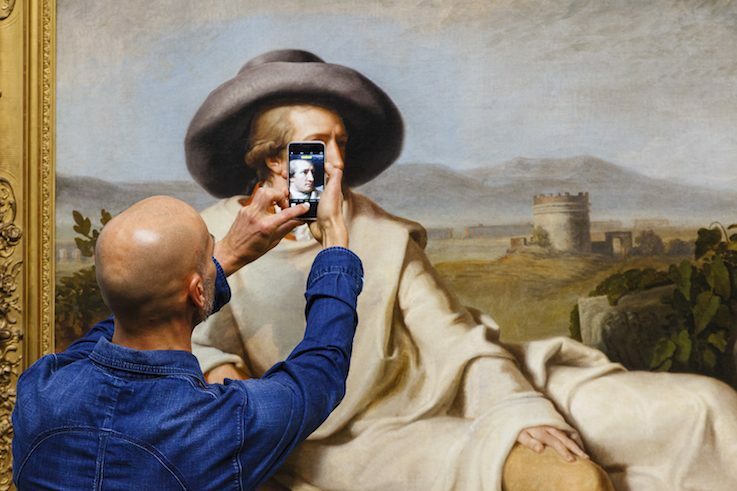 The Städel Museum in Frankfurt underscores the opportunities present in an unrestricted access for everyone in digital space. Here, too, the Kunstsammlung Nordrhein-Westfalen (art collection of the German Federal State of North Rhine-Westphalia) in Düsseldorf is committed to artists, but also recommends an individualisation of access. Still haltingly, but with increasing frequency, jobs dealing exclusively with the institution’s digital presentation are being created in museums. Where does one get involved? Not an easy question to answer because each platform has its own dynamics. And target groups’ accessibility cannot be broken down into simple formulae. 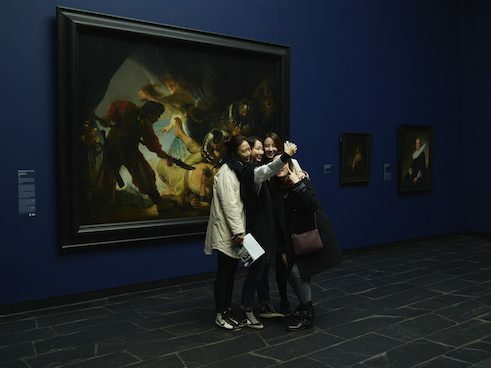 Selfie at the Städel Museum in Frankfurt | Photo: Städel Museum, Frankfurt am Main If one takes a look at museums’ Facebook activities, one sees that, apart from event announcements, postings about the museum’s own works that invite Facebook users to interaction with a trending hook/hashtag are popular. Some institutions are experimenting with the live-video function. Facebook functions like the merchandise displays in the shop windows of a pedestrian zone. Above all, major brands enjoy the greatest popularity. At first place with over 500,000 likes is the Mercedes-Benz Museum in Stuttgart. But exhibition houses with numerous temporary exhibitions also score points. Thus the Schirn Kunsthalle (Schirn Art Hall) in Frankfurt has almost 90,000, the Bundeskunsthalle (German Federal Art and Exhibition Hall) in Bonn a solid 75,000 likes. On the micro-blogging network Twitter, museums with enhanced interaction are rewarded. If they master real-time communication, they can present their contents to a wide audience and engage in conversation with them, above all in the case of internationally formatted actions such as #MuseumWeek or #askacurator. Connecting online and offline worlds makes sense in every respect. Here, museums can build up a faithful following that also acts as an analogue messenger for the institution. Numerous encounters, for instance in tweetups (personal meetings of Twitterers) have demonstrated this. On the occasion of its 200th anniversary, the Städel Museum had 120 participants on site – but all told reached many times that figure online. As guardians of auratic works and for the most part extraordinary architecture, museums maintain and administer valuable image motifs. By enabling access to these images via exclusive photo walks, they are particularly attractive to the growing community of photo-fan influencers on Instagram. Moreover, anyone who follows hashtags such as #artwatchers or #emptymuseum will get an urge to visit a museum. Media changes and transitions bring not only new parameters for the ways in which a museum must present itself outwards. Visitors’ expectations are also changing, since today everyone is able to produce their own contents and wish to make full use of the opportunity. In social networks interaction is what counts most. Put simply, Web 2.0 readily presents itself as the “participatory web.” It’s about much more than just clicking on the like button. Social-Media-Abend im Städel Museum Frankfurt | Foto: Städel Museum, Frankfurt am Main Highly successful actions in the social web live from the input of their participants. A case in point was #myRembrandt, an action initiated by Munich’s Pinakothek art museums. A specially-created replica of a small Rembrandt self-portrait provided bloggers and fans of the museum with the perfect template for telling their own stories. In this way, they became co-curators for new contents. Emotional relationships towards Rembrandt’s art arose, but also a close connection with the institution, which can count regularly on the supporters gained here for future actions. But it need not always be large-scale projects. The celebrated user-generated content can be initiated with smaller impulses. In this way, with the action #beuysheute (Beuys today), the Museum Schloss Moyland inspired numerous fans of the artist to contribute their own thoughts on the anniversary of his death, and thereby making his memory visible in the web. 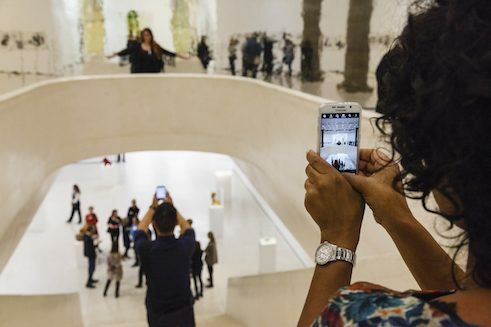 Social media evening at the Städel Museum Frankfurt | Photo: Städel Museum, Frankfurt am Main Another extremely popular action in various social networks is the #MuseumSelfie, an incentive to photograph oneself in a museum and by doing so become part of a world-wide action. In this way, the web assembles countless affirmations of a particular museum or even a specific work of art. The Osthaus Museum Hagen has even gone a step further and developed an exhibition just with selfie stations with celebrated works of art. In this way, the problem with image copyrights that in some institutions has led to photography prohibitions can also be circumvented. 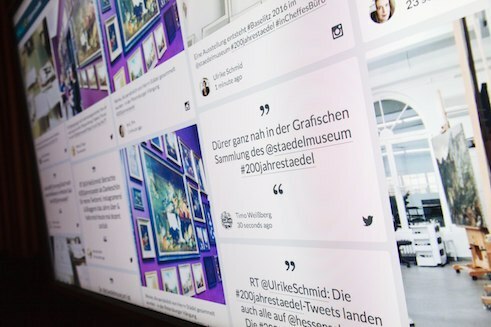 Social media evening | Städel Museum Frankfurt | Photo: Städel Museum, Frankfurt am Main If we consider the landscape of German museums, a great deal of space in the digital area must still be occupied. Above all, trained personnel are needed if the potentials of an open museum are to prove themselves viable for the future. Universities are therefore urgently called upon not to ignore the topic of cultural mediation in the social web. Then things will work out with the visitors, too. Anke von Heyl is an art historian and cultural mediator in both analogue and digital space. Since 2006 she has been blogging at www.kulturtussi.de , including on art mediation and the role of museums in the digital world. She also works as a consultant for cultural institutions in connection with their presentation in social networks. Copyright: Text: Goethe-Institut, Anke von Heyl. This work is licensed under a Creative Commons Attribution – Share Alike 3.0 Germany license.